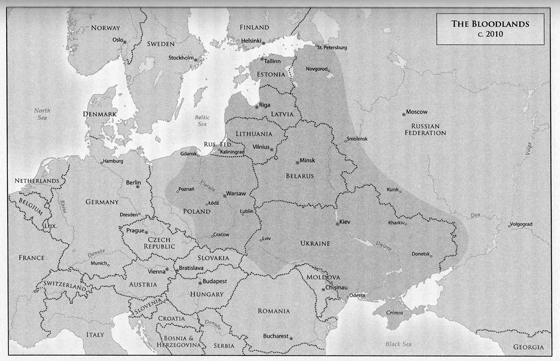 Timothy Snyder, Bloodlands: Europe Between Hitler and Stalin. New York: Basic Books, 2010. Snyder’s Bloodlands was brought to my attention in the context of discussing Fred Anderson and Drew Cayton’s The Dominion of War in late June 2014. Pr. Cayton mentioned Snyder’s approach at describing the violence beset on a region in eastern Europe termed “bloodlands.” For Snyder, this region extends from central Poland to western Russia, through Ukraine, Belarus, and the Baltic States. In the text, Snyder seeks to lift the veil on the sort of mass violence visited upon the region by both National Socialism (German Nazis) and Stalinism (Soviet Union). Snyder emphasizes, with strong prose and devastating precision, the methods by which the Nazis and Soviets murdered at least 14 million people between 1933 and 1945. Bloodlands is solely focused on the fate of civilians or soldiers whose treatment resulted in their deaths. This is an account about deaths OFF the battlefields, despite the fact that half of the soldiers who died in the Second World War were killed in the same region! From the preface onward, Bloodlands is both unrelenting and fascinating. As someone who has long taught that the horrors visited upon European populations by the Nazis were also experienced by the Soviets, I was “glad” to see confirmation of my past lessons. Yet the text is as frightening as it is fascinating. Snyder explains that the killing in the region took on five separate forms – forced starvation through state policy, executions of “enemies of the state,” executions of the educated elite (as Germans and Soviets killed approximately 200,000 Polish citizens between 1939 and 1941), executions of a variety of civilians, and depopulation that took millions of lives as the Nazis cleared their eastern frontier of people and industrial centers. Each one of these five policies reveals a horrific side of humanity. That five million Soviets starved, largely because of Stalin’s requisitions policies, is bad enough. That many individuals, particularly in Ukraine, were denied food and then called unpatriotic for daring to starve in front of witnesses reveals a horror that is hard to fathom. The simplistic quota-meeting efficiency of NKVD execution squads is mind boggling – two officers to hold a victim while a third placed a pistol at the base of the skull. Four such teams alone killed 20,761 people on the outskirts of Moscow in 1937 and 1938 (83). These executions came after troika judges might hear as many as sixty cases per hour, confirming the orders to kill at the behest of the state. The fate of thousands of murdered Polish officers in the Katyn Forest after the outbreak of World War Two was hidden by the Soviets as well as their allies. Ironically, the Nazis, who engaged in similar activities, attempted to reveal this mass execution to the world (a story seen in films like Engima, historical works, and historical fiction such as the Bernie Gunther series by Philip Kerr). Forced starvation of civilians in cities like Leningrad, the executions of hundreds of thousands of civilians in Belarus or Warsaw, the elimination of the Polish state and Jews in both Nazi and Soviet held territories – the list continues. Somehow, despite all of these appalling details, Snyder’s text is eminently readable and “easy” to follow with the notable exception of the eleventh chapter. In a text that makes links between all aspects of these policies that result in mass death, the post-World War Two coda on Stalin’s anti-semitism and eventual death doesn’t quite fit. I suspect that Snyder includes the section as a method of demonstrating how the “bloodlands” policies encountered resistance in the late 1940s and early 1950s. I would characterize this piece as working better as a separate article perhaps? Despite this very small misstep, Snyder’s Bloodlands is essential reading for students and professors of the twentieth-century.